Well, this sure is... uhhh. That is to say... er. Hm. Ever wanted to live in a house made of glistening meat, blanched bones, and striated fibers, all pulsating together in nauseating harmony? Now, now, don’t screamvomit (from excitement!) all at once. 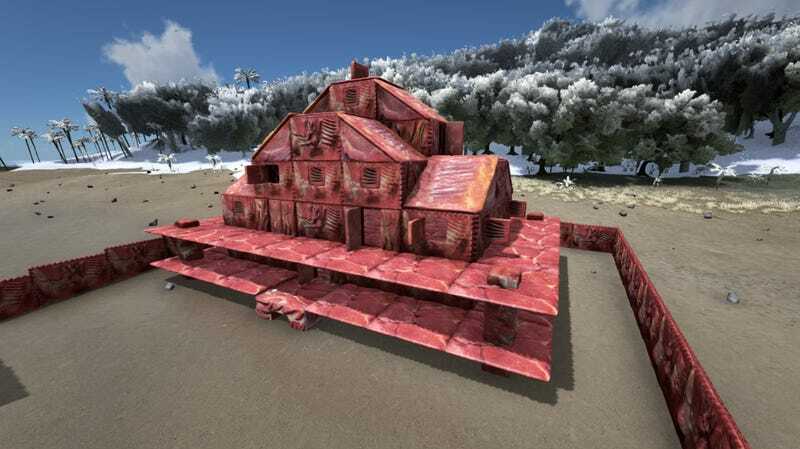 Instead, check out infinitesunrise’s Meat Structures mod for Ark: Survival Evolved. It’s everything you ever dreamed of when you first scalpeled open a small woodland creature at the tender age of six. That sounds kinda useful, actually—although over-gathering due to overpowered carnivores might not be such an issue after Ark’s recent dino downgrade. So there’s, um, that. It exists. Do with this information what you will. I won’t judge. I do, however, reserve the right to throw up on your shoes (probably also made of meat) and flee in abject horror.